A. W. Hofmann was a better public speaker than William Perkin. 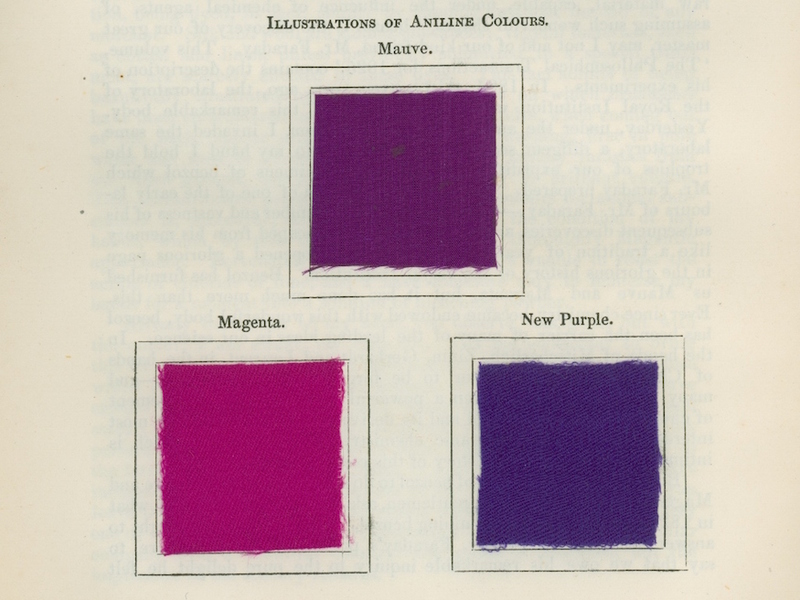 When he lectured on dyes at the Royal Institution in 1862 some copies of his address had his samples of mauve and magenta attached. This image is from one of them. Image courtesy of the Royal Institution of Great Britain. Shadwell lies at the end of a rainbow. In 1856 it transcended its dank and slimy sounding name with the birth of a dazzling colour. Aniline dyes, invented just off Cable Street, stormed on to the market, brightening clothes and homes as never before. 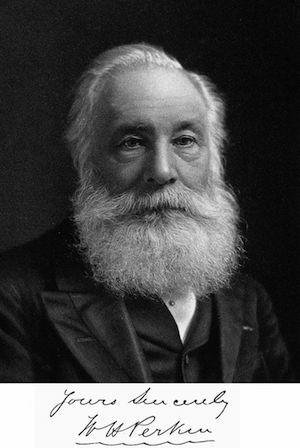 The discovery was also the coming of age of a puzzling but hitherto not very promising branch of science called organic chemistry, and it all came about when an enthusiastic teenager called William Perkin (1838-1907) decided to do some experiments at home. For Perkin it started with a bit of extra-curricula chemistry, then a highly unusual offering, at the City of London School. In the 19th century if you really wanted to take your chemical interest further, you usually went to Germany. But Prince Albert’s catch, AW Hofmann, was teaching chemistry in Regent Street and Perkin was able to follow his passion here. Chemistry did not seem all that useful. William’s dad wanted him to be an architect. Chemists, after all, were only good for preparing soap and a few acids, making a few other things explode, and reviving swooning ladies with salts of ammonia. Coal comes from long dead plants, and biological substances all contain compounds with a backbone of carbon, hence the word ‘organic’. Victorian chemists did not conceive the complexity they were dealing with. That’s why a teenager in Shadwell could contemplate a bit of kitchen chemistry and hope that he might hit upon something. It seemed, for example, that the wonder medicine quinine extracted from cinchona tree bark, and vital for fending off malaria among Britain’s colonial armies and administrators, might be similar to the aniline obtained from coal tar. Making quinine from discarded sludge instead of rare and exotic trees promised to save mountains of money. Perkin did strike lucky in March 1856 but not in the way he expected. Like the best scientists, Perkin dwelt on the interesting result he had obtained, rather than on what he failed to achieve. What result had he obtained? He'd made a mutant out of aniline, a dye ‘of extraordinary tinctorial power,’ as Hofmann put it. With the exception of t-shirts we do not usually paint our clothes because it makes them crusty and the colour falls off. Dye is different. It stains the fibres. Before Perkin, only plant and animal substances had done this. Remember the last time you failed to remove turmeric stains after a curry. Perkin’s dye was a profoundly patrician purple. He sent a sample of purple cloth to a Scots dyer and it aroused cautious interest. It was valuable but would it cost too much? It did not, and Perkin abandoned his pure science career in its cradle and, with money stumped up by his father, started manufacturing his dye. He had to become an expert in dying, first because the colour was initially not as ‘fast’ as he hoped and he had to find a way to make it stick, and then because he needed to nudge the methods of his industrial customers from their folkloric origins towards the scientific. In 1858 he opened his colour factory, appropriately, in Greenford. Greenford now has a William Perkin High School and its uniform, we are pleased to report, is purple. At this point Perkin had another stroke of luck. Purple came into fashion. The Empress Eugénie was wearing purple in 1857, and everyone wanted it. Once, only Roman emperors wore purple, extracted from sea snails in the Near East. In fact purple was so exclusive that for centuries our own noble Lords had to make do with crimson. Now though, Perkin could turn dirt into dye. By 1859 it seemed that every woman with means had turned purple. (The French word mauve was adopted because it brought some extra cachet from the Gallic word for mallow flower.) It was just the time that skirts were ballooning out too, consuming more material and more dye. Suddenly there was real money to be made from organic chemistry. Others experimented with coal tar derivatives and started new hares. The same organic chemistry which produced the colours went on to provide other pots of gold in the form of medicine, plastics, pesticides, detergents and perfume. Perkin made his pile and a few other colours. Fashion moved on, and in a few years alazarine red became the new purple. Although the initial synthesis had been done abroad Perkin found a better way to make it. The realisation that chemistry was worth research and investment was still strongest in Germany and remained there. Perkin sold up. But he was fêted as the father of a new industry for the rest of his life. Chemistry was not all about bright colours though. When the First World War interrupted the import of German khaki dye, British infantry recruits had to be clad temporarily in blue. The moribund British dye industry had to be revived and, when it was realised that another product of organic chemistry had the same coal tar building blocks as dyes, it was reshaped — to turn out high explosives. What is so special about carbon? NaCl, H2O and O2 are simple chemical recipes familiar to many people even if perhaps the last is not from an interest in science. If everything was as simple as this the universe would be plain and dull instead of teeming with everything from toucans to bacon flavoured crisps. The simplicity comes from the only one or two available hooks that each of these particular atoms (sodium, chlorine, hydrogen and oxygen) has to hang on to another. This idea of set numbers of hooks on different atoms was first put down by Lancastrian Edward Frankland in 1852. He came to live and teach in London, so we can celebrate him too. Carbon is special in having four hooks, a modest number, but it allows the possible arrangement of atoms into molecular nets, rings and chains to explode in number. Curiously, these shapes produce radically different substances, even if they contain exactly the same inventory of atoms. But when you mix things up in a test tube you cannot see the rings or chains of atoms, and nor could William Perkin even on his dying (or dyeing) day.